Uganda and the rest of East Africa (including the East African Community) are undergoing a commercial law reform process, with new laws being enacted and others at different stages of being enacted. These reforms aim to promote technological innovation and progress. However, each of these laws and draft laws, in their present form, also has a human rights dimension as far as access to educational materials, essential medicines, and food security are concerned. The media capacity building program is part of CEHURD’s advocacy for a fair balance between the rights of holders of intellectual property rights (inventors, creators, authors, etc) and the interests of the wider society that consumes goods and services. The overall objective is to build competence in the mainstream media in Uganda to understand, appreciate and competently report issues of intellectual property and human rights. This process will gather well-investigated and balanced stories that illustrate the opportunities and challenges Uganda and the region face in enacting intellectual property that appropriately serve the development needs of the country/region. The objective is to highlight the role the media is playing in shaping the public debate and perceptions around intellectual property reform process. A selection of the submitted stories will be, rewarded, published and shared amongst development partners and stakeholders as good practices. to food and food security; and access to educational materials. How Uganda is progressing in the area of legislating intellectual property nationally and at the EA C? These stories should critically look at the process and the impact of the current Laws that Uganda has and potential outcome if adopted in their current status. How the current Plant Variety Protection Bill affects social welfare. How will the ordinary, smallholder farmer who has no idea what intellectual property rights are be affected by this law? Or what happens to food security in Uganda once that Bill is passed into law? What difficulties does the current Copyright and Neighboring Rights Act pose for students in high institutions of learning. Journalists interested in this area should be ready to investigate the challenges students face in accessing academic materials, or how medical practitioners access health information and the problems they face accessing the same. What will be the impact of EA C laws such as the EA C Anti-counterfeit Bill and policy on Ugandan as a nation? 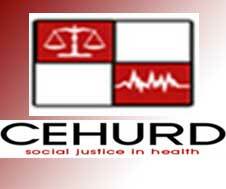 This call is restricted to journalists in main stream media and particular priority will be given to those who are actively participating in the mentoring program at CEHURD. Interested candidates should send a one-page concept, briefly stating what the proposed story is about, pending questions to be answered by the fieldwork, proposed sources of information, a work plan and modest budget. Journalists with creative ideas will be facilitated with financial and technical support to investigate them and compile articles. CEHURD will meet expenses for travel, meals, communication, stationery and consumables, out-pocket-expenses and meet other costs directly related to the process of investigation. NOTE: The arti cles don’t have to be published or broadcast for them to win a prize.